Stand out and make a statement with our Feature Wall! Made in Britain from a premium quality fire retardant white polyester. Our backdrop has a high gram per square metre weave giving the material a luxurious feel and exquisite look. Our feature wall is back-lit using ice white LED’s. As with all our backdrop curtains, We supply these on the heaviest duty free standing pipe and drape frames available to the UK. 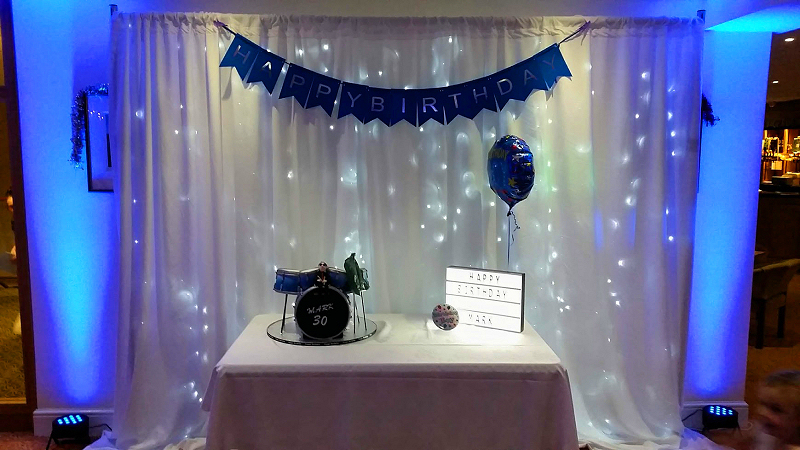 Give the cake pride of place, Paired up with a personalised message on our Cinematic 4 Line Light Box. New for 2019 > Royal White Post Box for all your celebration cards. Included in this hire package! Note: Cake, Table and linen not supplied. Up-lighter’s shown for demonstration purposes. 2x Up-light Units can be added for just £10.00! Hire includes Star-Lit Feature Wall and Cinematic 4-Line Light Box. A travel charge may be applicable for venues over 20 miles. Subject to Avbailability, We will advise at the time of enquiry.